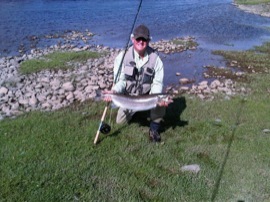 A fine 13lb salmon from the Browse Stream of Birgham Dub on Tuesday 21st August 2012, taken on a 2 inch Red Francis by Richard Doyle, one of 7 fish for the day. This entry was posted in Uncategorized and tagged Angling, Birgham Dub, fishing, FishTweed, River Tweed, salmon, season 2012, Tweed, Tweed Valley. Bookmark the permalink.